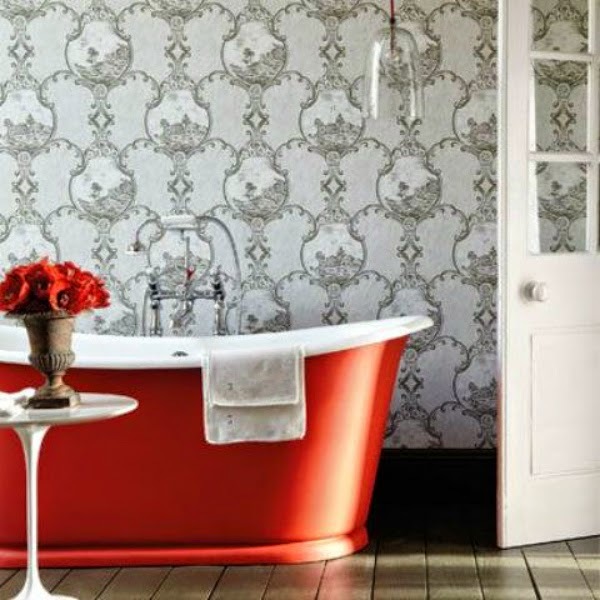 Just out of curiosity, I Googled "red bathroom decorating ideas" thinking that there would only be a handful of photos. After all, red is a very strong color and I couldn't imagine using it in such a small space for anything other than an accessory. I. Was. Wrong. There is not much I can say, so I will let these photos (and you) do the talking. Mirror, blow dryer and chandelier..rock on! I don't know who lives here, but I want to spend at least one night soaking in this tub! Sunglasses are a must! I love clawfoot tubs! Don't you?! So what about you? Could you take the plunge and "see red"? Leave a comment and I will send you some "red" hots! Happy Tuesday! **All photos, except my own, were borrowed from different sources on the internet via Google! I had a red dinning room in my last house, but it wouldn't work in this house. Red was super popular about 10 or 15 years ago and then everyone went white. 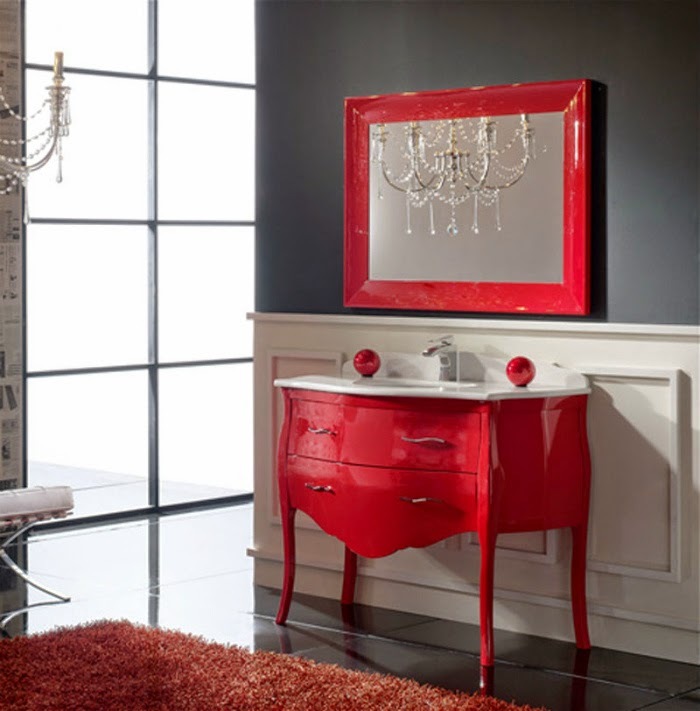 I definitely agree – the wood furniture tones down the red and the white in that bathroom. Funny how colors trend. I couldn’t even begin to make red walls work in this house. On the TP, I know, right? I’m allergic to red dyes, no telling what sort of reaction that would cause….LOL. We had a great Easter, I hope you guys did as well! Hugs!! Benita, I am a cobalt blue fan, swap that out with all the red and I want each and everyone of these rooms. They are gorgeous. The white makes it look so clean and modern. Fun. 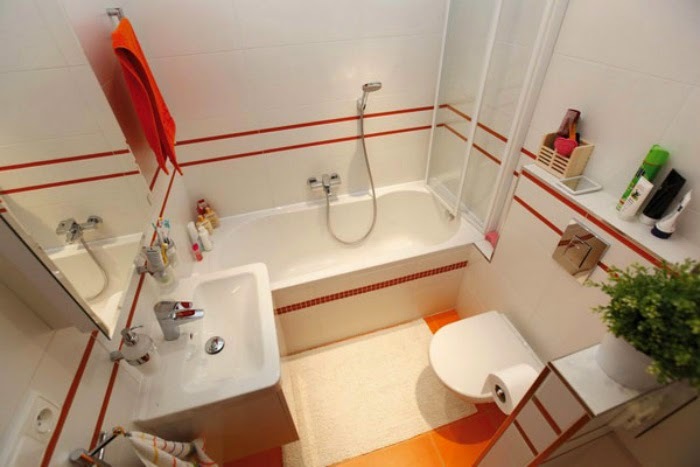 A bathroom that you want to wake up to in the morning! 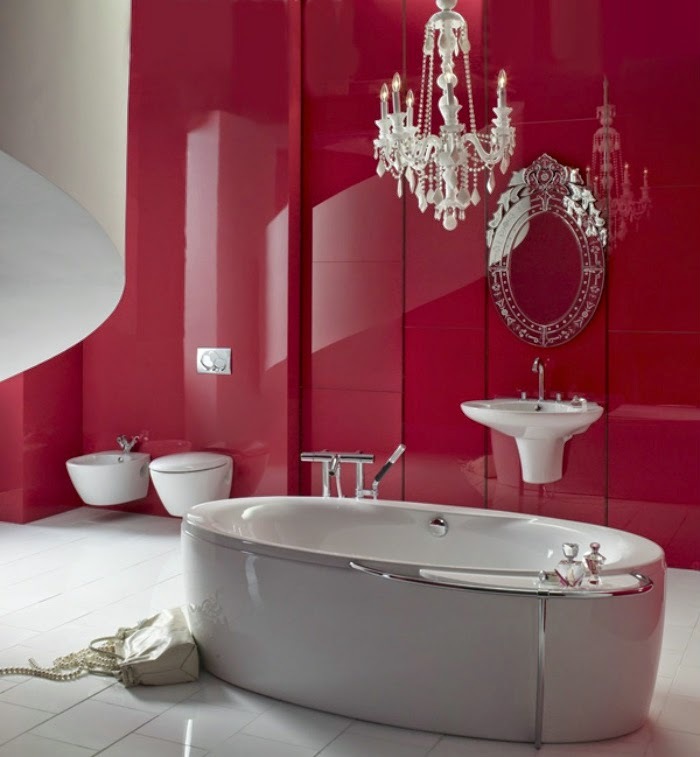 Love the tub in photo #2 and the chandelier in #3, and in the last photo I love the chest that the sink in placed in! Love! Thanks for the bathroom eye candy! Hi Nikki! You are quite welcome! :-) They are some pretty awesome bathrooms to be sure! And I agree, the very last one has a very French Provincial style to it! 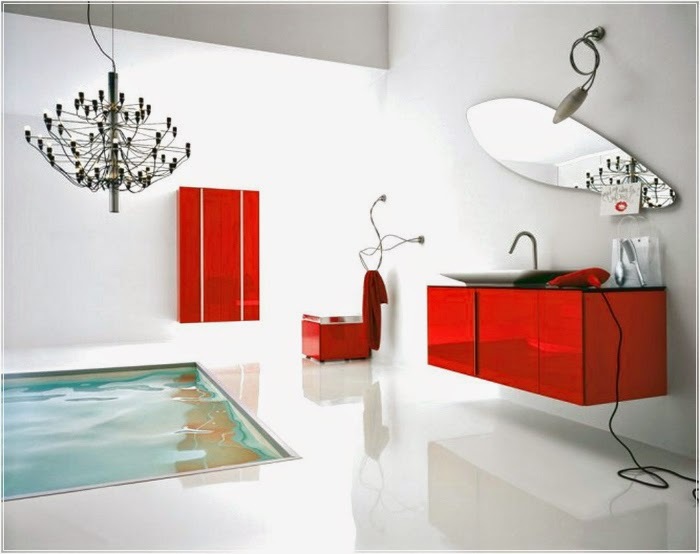 I would have never thought of using red in the bathroom until I saw these...now...who knows! Have a great evening! 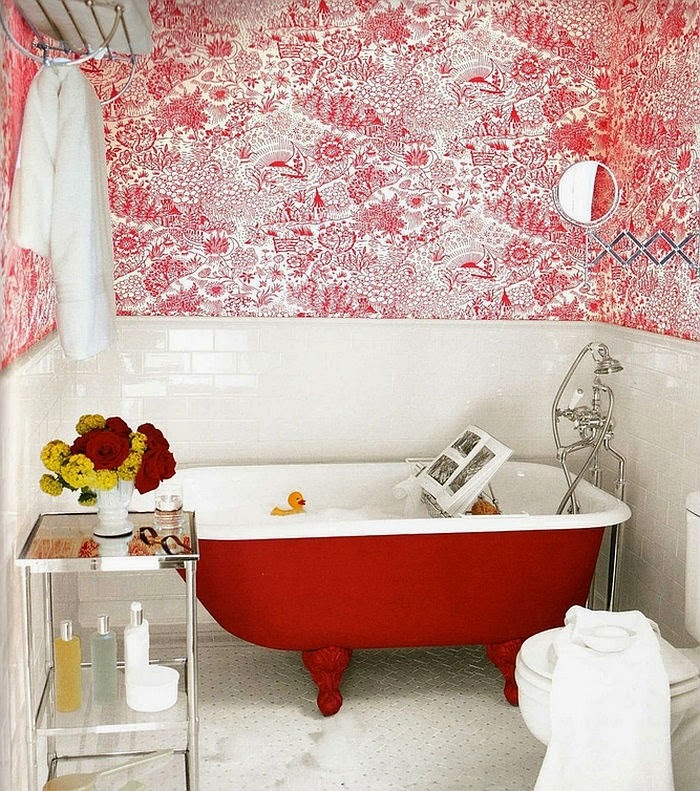 I love that red bathroom. I am going to paint our second bathroom red and paint the dingy wood white. I'll have to take a pic of before and after I'm done. I like your site. I found it through "View From in Here." Hi Meena! And thank you for popping over! 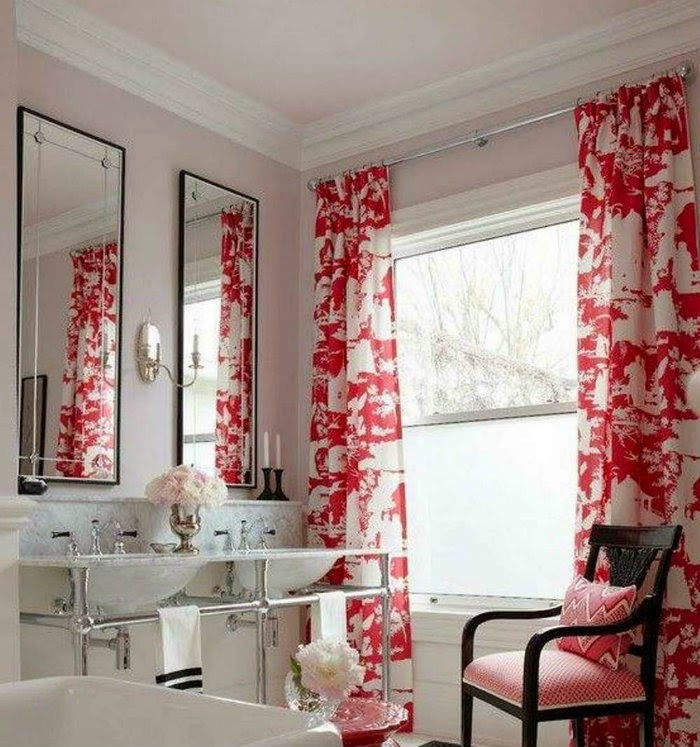 I love these bathrooms -- they are so spectacular! 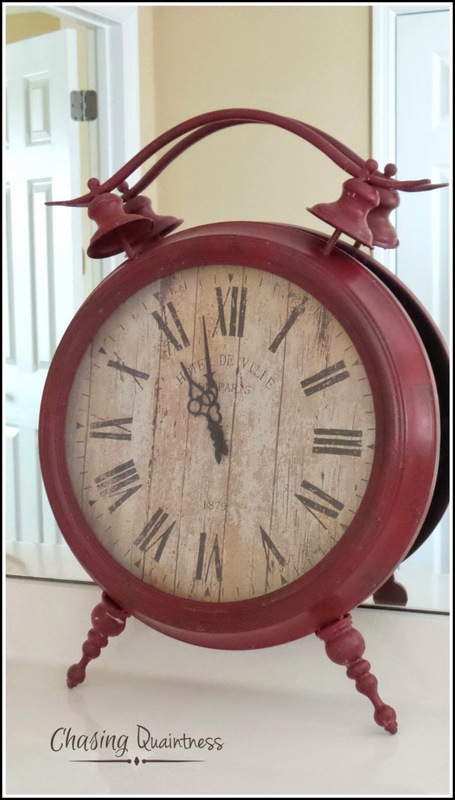 That will be awesome on your bathroom and I bet it will be beautiful! If you think about it, send me a pic! I would love to see it! Have a great evening! 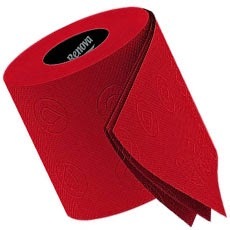 Red TP? Would never have dreamed of such a deep red TP! I loved looking at all these rooms, but could not live in them. Too dark. I know, right! Crazy on that item for sure. I laughed when I came across it and just had to finish the post with it…LOL. The rooms are gorgeous, but you are right, most of them are just too dark. My favorite is the one with the wood piece in it and the white beadboard. 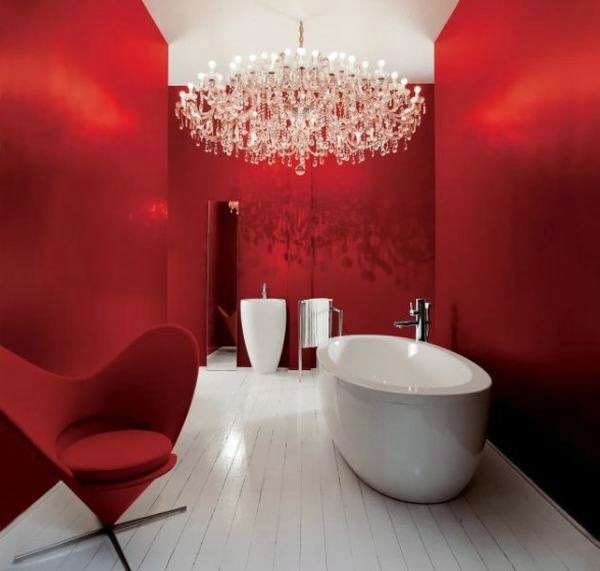 I think you would have to have the right kind of house to use red in the bathroom. Have a wonderful day! HUGS!! 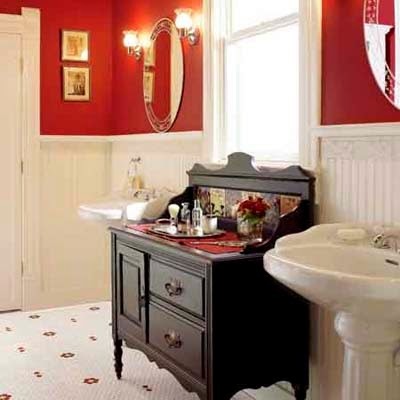 I'll take the red clawfoot tub, and put it in the bathroom with the double pedestal sinks (but not the red paper please.) Red is my happy color!! !